Ther. 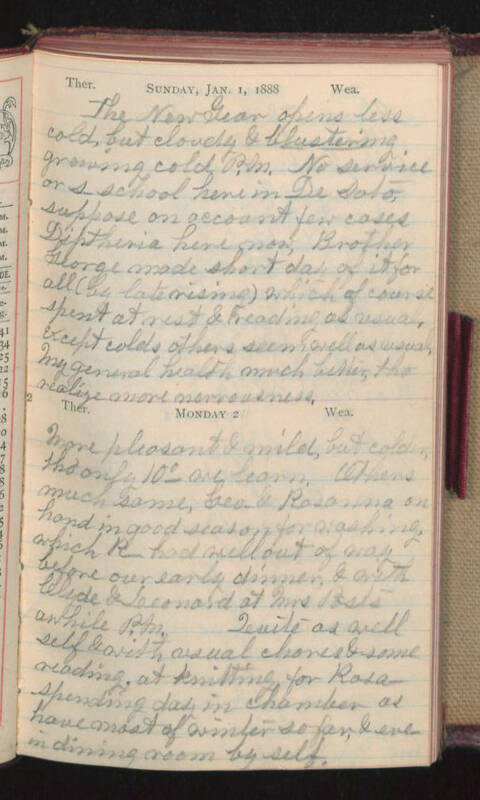 Sunday, Jan. 1, 1888 Wea. The New Year opens less cold, but cloudy & blustering growing cold P.M. No service or s-school here in De Soto, suppose on account few cases Diptheria here now. Brother George made short day of it for all (by late rising) which of course spent at rest & reading as usual. Except colds others seem well as usual. My general health much better, tho realize more nervousness. Ther. Monday 2 Wea. More pleasant & mild, but colder tho' only 10 [degrees] we learn. Others much same, Geo. & Rosanna on hand in good season for washing, which R- had well out of way before our early dinner, & with Clyde & Leonard at Mrs. Posts awhile pm. Quite as well self & with usual chores & some reading, at knitting for Rosa- spending day in chamber as have most of winter so far, & eve in dining room by self.